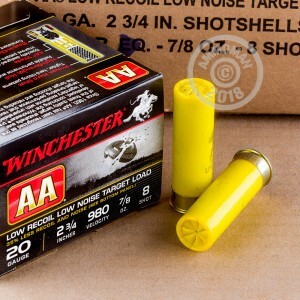 If you plan to shoot for a long stretch or want to help a new shooter, try these 20 gauge reduced recoil shotshells from Winchester. Each shell in this box of 25 fires a 7/8 oz. column of #8 birdshot at a muzzle velocity of 980 feet per second. Although this velocity is somewhat lower than that of full power loads, these shells maintain the same shot volume typical for a 20 gauge. 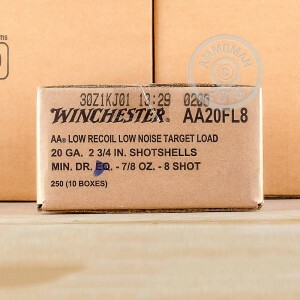 These shells also produce reduced noise, a notable benefit even with adequate hearing protection. New shooters in particular will appreciate this! 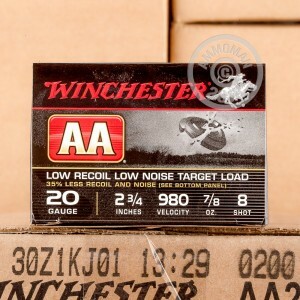 Take advantage of this low-recoil load's properties with a bulk order at AmmoMan.com. Remember, all orders over $99 with us ship for free!